Adios to commitments, cables, collection of discs, satellite dish, DVB’s, and the never ending list of conventional know-how!! mind you....with no strings attached!!. Your one stop search for the most sought after Live Indian TV Channels, Bollywood blockbuster movies, Catch-up TV and TV Shows all in one media player: The YuppTV Media Player. Introducing the all new YuppTV Media player!! Supercharge your TV with all new YuppTV Media Player. YuppTV media player is a compact and portable Wi-Fi enabled player, viewers can access more than 180 channels worldwide in 10+ languages apart from a library of unlimited Movies. Content will be made available in 1080p High Definition (HD) to subscribers. Once set up, using the player, users can access content with the touch of a button. It’s easy as a pie! Through the customised YuppTV store, subscribers can access unlimited entertainment. 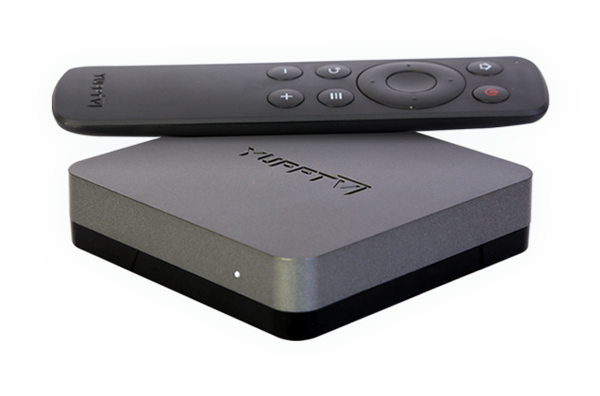 Order for your YuppTV Media Player today!! Or grab it from your nearest dealer!! YuppTV Store: Get access to unlimited entertainment through the apps (coming soon) available on YuppTV Store. Media Center: With Media Center, you can access all your content on USB drive onto your big screen. All you need is to connect your USB to YuppTV Box. Push media content on the mobile device to TV, seamlessly! YuppTV 2014. © All rights reserved.